I'm a firm believer in protecting your personal data, and just having a password to log into Windows isn't exactly protecting anything that a motivated 14yr old couldn't get past. If you really want to protect your personal information, I highly recommend getting the TrueCrypt Program and follow the instructions of the attached document on creating an Encrypted File Container to store your data. That container can then be copied to any thing, even online backup places. You can be sure that your data will be safe. Here's another tip. Everyone knows that you should really be using complex passwords to secure your data. Problem is, complex passwords are difficult for most people to remember, so they write them down. Thus voiding the complex password. I came up with an idea a while ago on how to store a complex password in plain sight, and all you as a user would need to remember is a coordinate and a direction. 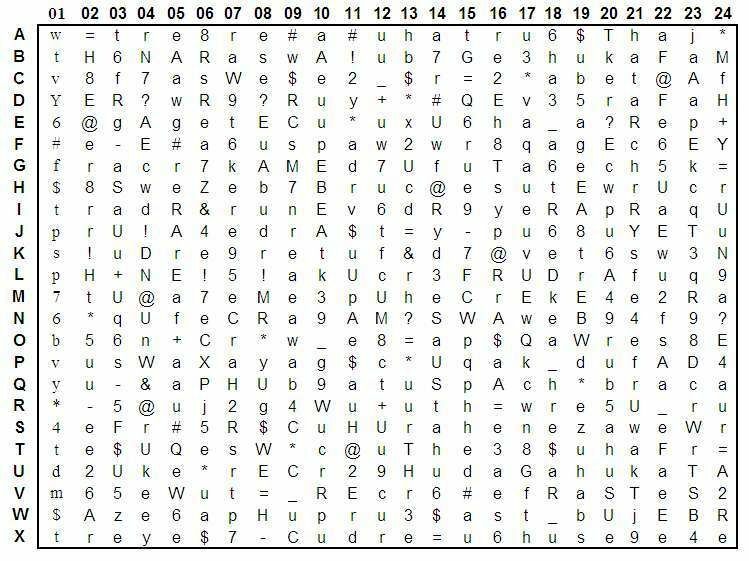 This is a grid of 24 randomly generated complex passwords. Let's say you needed to pick out a password for our Truecrypt drive. Select a coordinate, direction and length, and that's all you need to remember. The grid could vary in size, and you could store bunches of passwords in the grid. What do my fellow IT type guys think? Good solution? ^ That is actually very nice, It is actually implementing and sticking to that takes the work. If someone breaks into your house and steals your laptop or computer, what can they have access to? Have any passwords autosaved to websites? done any online banking? Have any pictures of your family or guns on your computer? anything in your browser history that could compromise you if anyone found out? How about your search history or even work documents? NuclearSociety, proud to be a member of pa2a.org since Sep 2012. That is actually awesome, I can see myself using something like that in the future. EDR, proud to be a member of pa2a.org Till the End! (09-08-2012, 11:37 PM)NuclearSociety Wrote: ^ That is actually very nice, It is actually implementing and sticking to that takes the work. My computers employ full drive encryption on the system drives. You can't get to the OS without knowing the complex password to get in. Even pulling the drive and plugging it into another computer is useless, as the drive would just appear to be empty/unformatted. Oh believe me I know, I am in the process of getting mine done, its just finding the time. I was just posting that for others who may come into this topic. I see the password cheat sheet as a very bad idea. You're providing an answer key which is far more complicated to remember than the password they will be using. Think about it, if someone can't remember v8evvEas$ do you really think they're going remember c1 t17 x23 p1 k17 e8 p5 x19 j11 instead? And if they DO remember that, then that is a much better password anyway if they throw in a caret or dollar sign in there somewhere. And in making that password, it was far too easy to make a typo by not following the coordinates very well, without rulers or T squares. The best passwords are 14 character: upper, lower, letters, numbers, special characters non sequential key strokes so you can't use 1qaz@WSX3edc or some derivative. The only way to do this is think of a password that you will remember in the means in which you will remember it and not write it down or forget it. And if you feel the need to write it down, find a focal point in your office or bedroom or wherever that will serve as a reminder to you. For instance, if Princess Bride is your favorite movie, it becomes: 9r!Nc35%8Rid#! with an extra ! at the end. Of course, I just winged it for illustration, but if you get down to it you just do the characters in order of Number, lower, special, upper, lower, special, number, upper, special and then substitute the letter accordingly. 5 = S, 3 = E (and # is 3 or E) etc. That pattern and your movie serves as a good memory jogger for most, especially since it's easier to remember patterns than it is what that pattern represents. Regardless, passwords have to work, and the only way they work is when they are NOT written down. You sacrifice convenience and speed for security the more secure you make any password. Even today, the first thing I do when I sit down on a users computer is look under the keyboard for a written password. Don't find as many as I used to, but they're still there. Also, have you tested by taking your encrypted drive out of the computer and put it into another computer and had the BIOS of the other computer recognize it? Can you still access your encrypted data? Camper, you missed the point. They only need to remember one coordinate, which would be the start of the password, the direction the password is going in from there and the length. As for pulling the drive, the BIOS will recognize that there's a drive there, but, if you attempt to boot it up, it will still prompt you for the decryption password. If you attempt to read it as a secondary drive to an already booted up system, it appears as a unformatted/blank drive. (09-10-2012, 07:32 AM)streaker69 Wrote: Camper, you missed the point. They only need to remember one coordinate, which would be the start of the password, the direction the password is going in from there and the length. But then that's potentially worse, because now you have 96 possible passwords to pull from (if you go up/down/left and right) and these encryption programs tend to reset after a certain clock cycle goes past, or if you have a cracker you just add all 96 passwords into it and you're done. Also, I'll look into that encryption software, I've gotten into McAfee's solution by dumping the drive into a Win 7 box. Could have been a fluke or an improper configuration, but I found it unsettling. Convenient, because I needed to get that data, but unsettling none the less. EDIT: In either case, I'm not a supporter of blatantly hiding the password in plain sight. It's more than 96 combinations. You're not thinking 4th dimensionally, Marty. It could be up, down, left, right, diagonal, reverse diagonal, or any combination of them.